The Internet is nowadays a major component of the contemporary world. Nonetheless, networks do not emerge in the void. They interconnect physical or logical agents that exists concretely and are therefore subject to diﬀerent forms of physical, political or economic constraints. The network itself extends the abilities of its participating nodes and therefore go beyond the local constraints by opening new spaces or dimensions. This the interplay of local constraints and global advantages that shapes the structure and properties of these new spaces. Internet and the cyberspace are built over equipment and infrastructures that are positioned in the geographical space. These physical component anchor strongly Internet, and the cyberspace, in the terrestrial space. Cyberspace is a virtual and vaporous cloud that is rooted ﬁrmly in the concrete of geographic, economic, political, and physical interferences and constraints. Overcoming these constraints have entailed colossal investments and for classical actors like governments or economic players, communication cables, satellites, data-centers, servers, etc., are vectors of power enforcement. Generally the distribution of Internet infrastructures in the terrestrial space poses classical problems in geography and geopolitics, like spatial planning or spatial inequalities, etc. One could therefore incline to think that Internet can be treated as any other infrastructure network like roads, pipelines, or energy transfer grids. Thus, the addition of a new type of artefact to classical geography or geopolitics should not transform the way of strategic thinking. However, a more precise analysis of the concept of cyberspace shows other dimensions to the discussion. We all have an intuitive feeling about the " cyberspace ", but is it a new space or just an extension of the space that have been studied for a long time by geographers? Do humans have the same appropriation relationship with the cyberspace as we observe in classical geography? if yes, can we talk about cyber-territories and discuss about the power struggle to control them? Nonetheless, projecting any power needs information to decide its usage and to control its action. By shaping the way information are exchanged and are ﬂowing in the cyberspace, the Internet changes the distribution of power. During the past two decades, new actors have emerged that build their power, i.e., their ability to impact both the real world and the cyberspace, through gathering information of diverse nature. These actors project their " cyber-power " to dispute to each other " cyber-territories ". This competition has not remained in the cyber-dimension and is concretely changing the contemporary world. In a nutshell, real world power shape the Internet and in return the Internet changes the very basic nature of power. Understanding how this evolving interaction loop acts and shapes the contemporary world economics, politics and geography is of paramount importance. 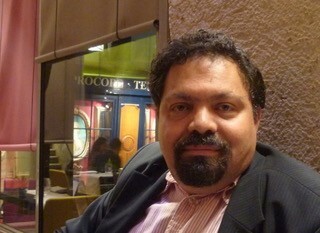 Kavé SALAMATIAN is a full professor of computer science at University of Savoie. His main areas of researches has been Internet measurement and modeling, network security, and networking information theory. He was previously reader at Lancaster University, UK and associate professor at University Pierre et Marie Curie. Kavé has graduated in 1998 from Paris SUD-Orsay university where he worked on joint source channel coding applied to multimedia transmission over Internet for his Phd. In a former life, he graduated with a MBA, and worked on market floor as a risk analyst and enjoyed being an urban traffic modeler for some years. He is currently distinguished visiting professor at the Chines Academy of Science and also working closely with the Castex CyberStrategy Chair at the French National Defense Institute. He has been the recipient of a Chinese academy of Science Presidential Award in 2018. He is working these day on figuring out if networking is a science or just a hobby and if it is a science what are its fundamentals. In particular, he has been working on cyber-strategy, cyber-geography and the interaction between Internet and society specially on the impact of large scale Artificial Intelligence on societies. He has written a book on a comparative analysis of nationwide strategy of Artificial intelligence that will be published in March 2019. He has published more than scientific 150 papers. J. Robin, K. Salamatian, Envisioning Cyber-geography, in "Hérodote" 2014/01. AAVV, A Cartography of Web Tracking using DNS Records, in "Computer Communication" 2019/134. L. Salamatian, D. Kaafar, K. Salamatian, A Geometric Approach for Real-time Monitoring of Dynamic Large Scale Graphs: AS-level graphs illustrated. AAVV, Les nouveaux territoires stratégiques du cyberespace : le cas de la Russie, in "Stratégique" 2017/04.